When my maternal grandma was a little girl, her uncle made her a bed for her dolls. She was born in 1918, and I’m not sure how old she was when she received her doll bed. But I think this bed must be about 90 years old. My mom gave it to Lily for Christmas in 2006, when Lily was two years old. 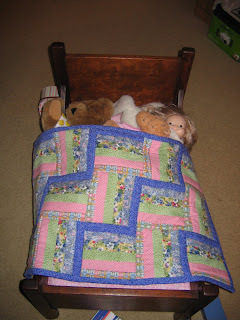 Mom also made a little doll quilt for the bed, which matched the crib quilt Mom made for Lily when she was born. I’m sure this bed only has sentimental value, and it is in my daughter’s bedroom right now. Do you have an heirloom hanging around your house? Where did it come from, and why is it precious to you? What an amazing family heirloom! I am a triple negative 4-1/2 yr survivor of breast cancer. I take each day as it comes & try to makethe most of it. I am the first one in my family to have breast cancer and never thought it would happen to me because of that – I found out how wrong I was! I loved reading about Grandma's Bed. Your daughter is so blessed to have it and to be able to pass i on from generation to generation.I love your blog, thank you for introducing yourself to me.I wish I knew how to do all the background, etc. you do to your blog, maybe someday soon I will learn how! What a wonderful heirloom. Just wait until you pass it on to your granddaughter someday! Sigh. This bed and the quilt are precious! Thank you so much for introducing me to Mommy's Piggy Tales- I am starting next round in October:) I am blanking on heirlooms at the moment…now I am curious as to what we have around our house…. What a lovely little bed. And the memories are even better. The only thing I own that used to belong to my grandmother (who I was named after), is a silver bracelet. It is practically worthless, but it used to belong to my gran. Even if I never saw her wear it. That would warm my heart to have that heirloom. You are so lucky! Awww…what a great little doll bed, and a great story! We have a child's rocking chair this isn't quite that old, but I have pictures of me in it as a baby!! What a beautiful heirloom cradle! How sweet it is that Lily is able to play with it and form her own memories that she will pass down to her children someday. I'm so glad you posted this! That's really neat Ginny! Wood is such an amazing thing. YOur bed and my rocking chair really don't look their age at all. What a special and wonderful gift and I love how she made a quilt to match. What a precious heirloom… it's beautiful! Well since she put 50 years or older then I guess I am one….LOL, or at least come January.Yes, I do. My grandmother passed away two years ago this month, at the age of 93. She left me her silver. It almost matches mine! I am the oldest grandchild and receiving it in my later years made it even more precious.